Kansas State student Kendall Harvey built his own Tron light cycle and shared the results with Reddit. If you were a science fiction fan growing up in the late ’80s, the Tron light cycle was one of the coolest things you’d trade in all your Pogs and G.I. Joe’s for. One Reddit user got tired of waiting so he decided to make his own. Using 96 feet worth of electroluminescent (EL) wire, Kansas State freshman Kendall Harvey created his very own light cycle inside his college dorm. Harvey created the bike using parts he found on Craigslist and a local bike shop. 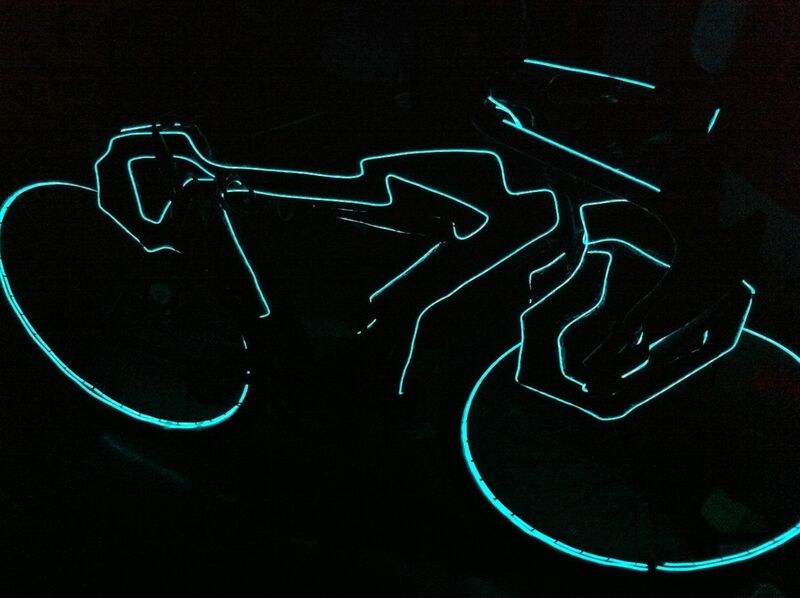 The bicycle is lit up using four different electric systems run on 9V batteries. Each lighting system is bound the wheel hub, and the drivers for the body and fork are built into the frame, said Harvey, who also works part-time as a model builder for a Legoland Discovery Center. All in all, the bicycle and parts cost about $600. Harvey took a break from riding his light cycle around campus to give readers some insight into how they can make their own. Harvey posted a photo of his light cycle on Reddit, where more than 400 people helped it reach the top of the front page Monday night. “But have you got a Sound FX box attached to make the [light cycle] noise?” commented theLeica. “Backpack with with speakers, and the Daft Punk album,” replied Harvey, referencing the soundtrack from Tron: Legacy. Harvey has no plans to mass produce the light cycle and is instead busy switching his major from engineering to industrial design. In the meantime, Harvey already has plans to upgrade the bike’s wheels.